Unlike the past JYJ’s In Heaven albums, Tarantallegra is a rectangular-shaped album measuring 215mm (width) X 159mm (length) X 15mm (thickness). 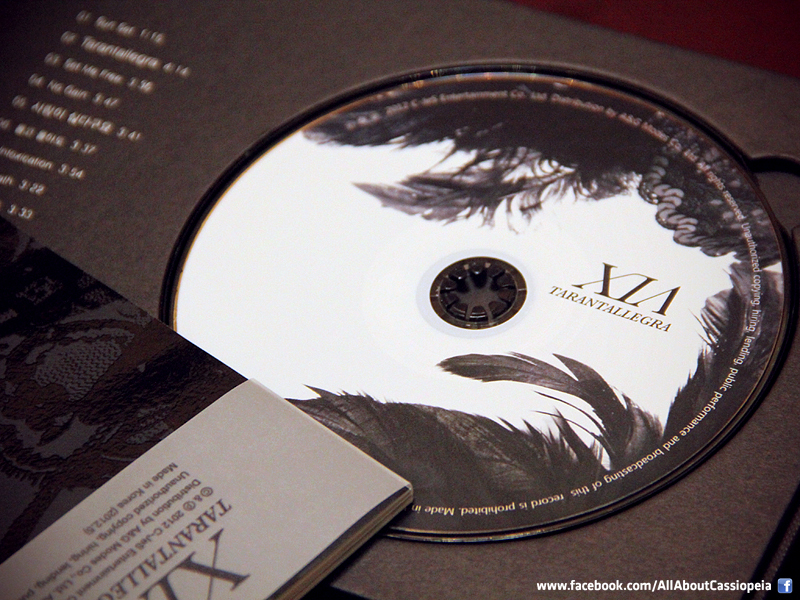 This album is entirely covered with a transparent glossy-like plastic packaging, showing only words of “XIA TARANTALLEGRA” and ‘feathers’ from the album concept. Behind the cover shows a bar code printed on it and a licensed sticker as a proof of purchase directly from Korea. After sliding the album from the external cover, you can feel the hard-textured package. The texture for this album is the exact same as the JYJ In Heaven Special Edition album. For those who own the JYJ In Heaven Special Edition, you will likely know the type of material that I was referring to. 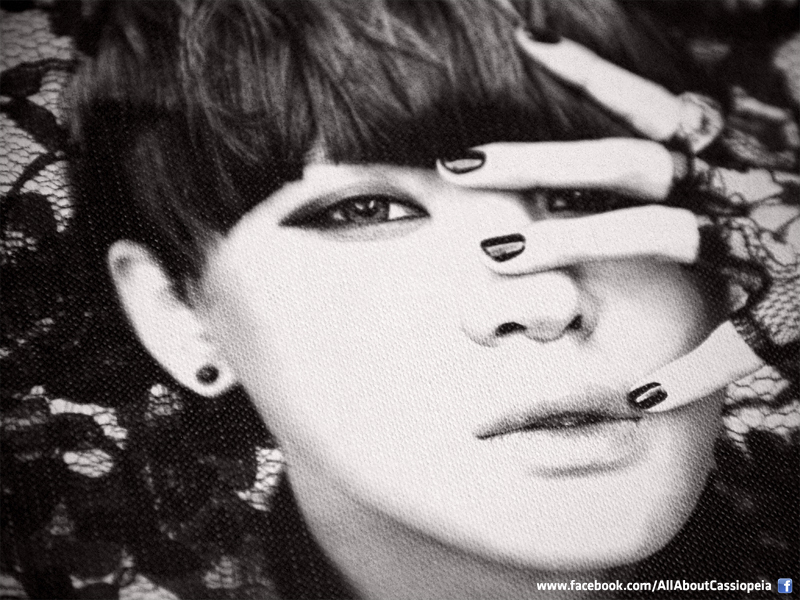 When the cover is removed, you can see Junsu’s face more clearly with his male eyeliner, more make-up and black manicure. The album is opened from one side only which is from the right. At the another side of the album is written the title of the album, the album code as well as C-JeS Entertainment’s official logo. The back of the album shows the copyright description for this album and that it is made in Korea in May 2012. 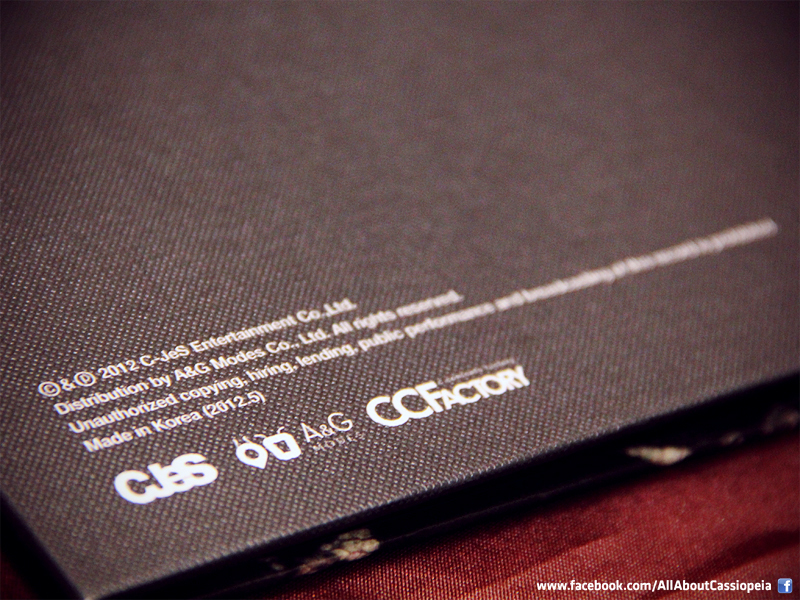 As always, beneath every description shows the company logos that participated in this album: C-JeS Entertainment, A&G Modes and CCFactory. After opening the album from the right, a 40-page photo book is placed right above the CD, without anything holding onto it. 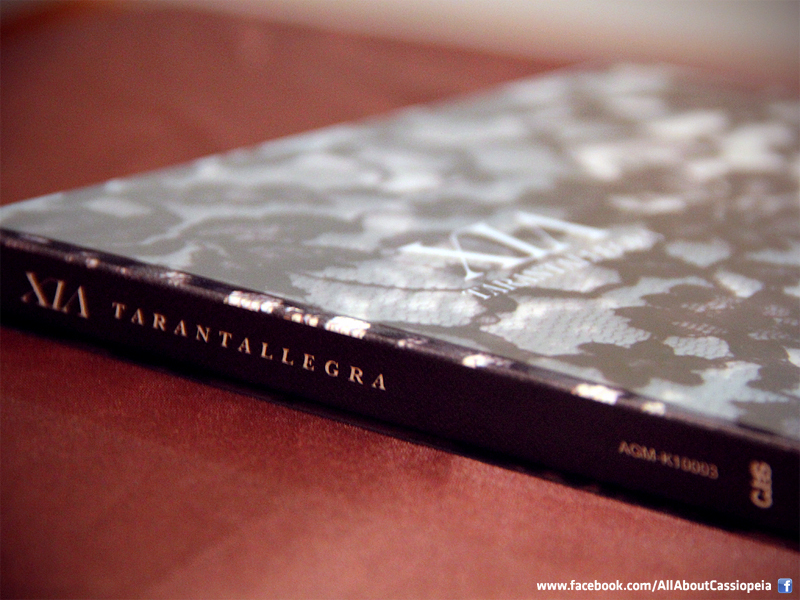 Push the photo book away, it will reveal a nice-designated concept CD for TARANTALLEGRA. The CD is placed onto it’s position while on the left shows the track list of all 12 songs with their duration written. For the photo book, it is handled with a semi-transparent strip at the side of the opening, both the album title and copyright description are printed onto it. The strip is removable in order to reveal the photo book. The outer photo book has a very smooth and embossed texture while at the back (bottom left), once more, has the copyright description and it’s embossed as well. 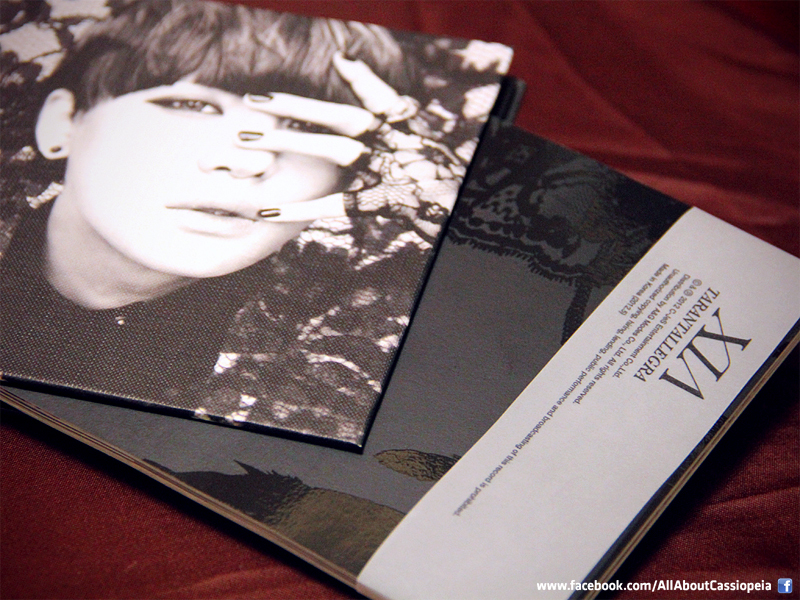 The outer photo book is in total black as well as the wordings and designs. Due to the embossing, you can see those wordings and designs shine when light is reflected onto it. 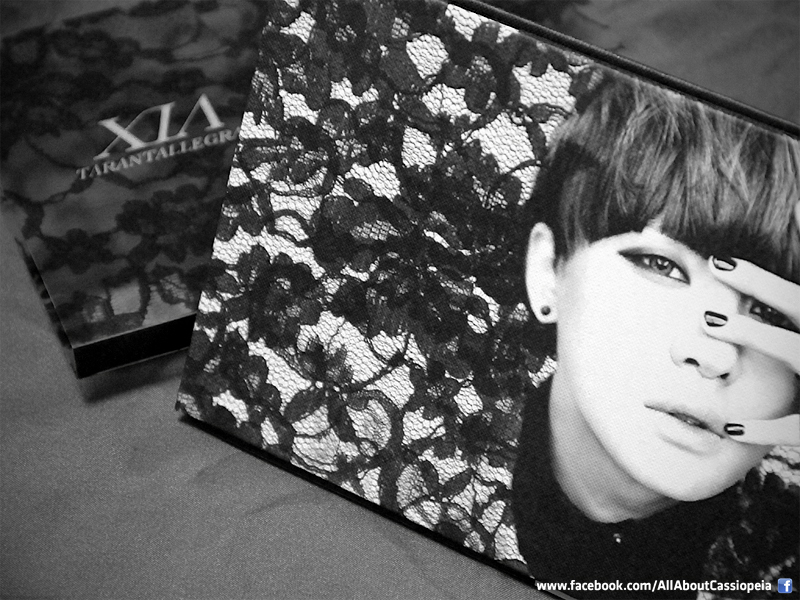 Inside the photo book shows some exotic, never-before-seen photo jackets of Junsu for Tarantallegra. All the photos are well-captured and superb, showing a new and different look of Junsu. 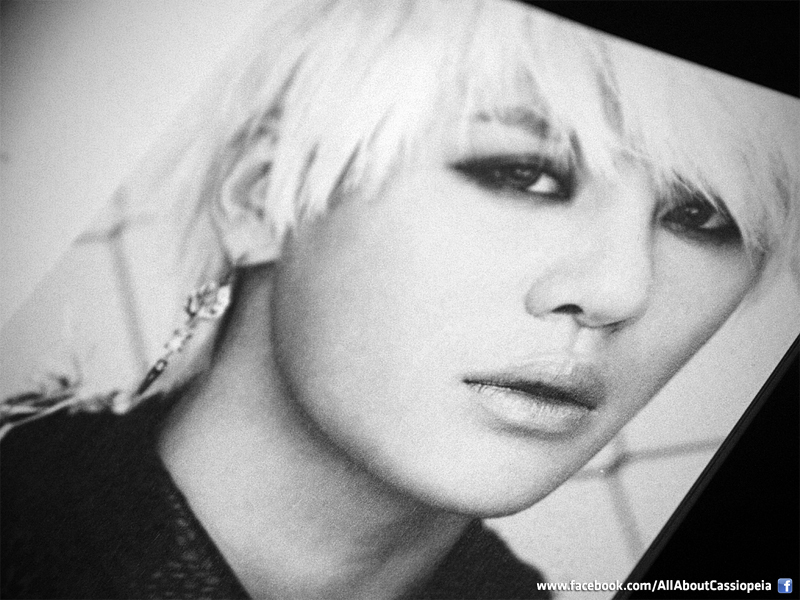 There are many close-up photos of Junsu posing for his album too. I find that the photo book is really creative: the designs and the way the photos are assembled together, comparatively to the In Heaven albums. The lyrics of each songs are printed onto the pages of the photo book, as usual. There are only two photos that are printed differently among the others as those two pages are actually transparent. At the last page of the photo book shows the credits, ranging from the songs, photographers and album production. Conclusion, this album is very creative by far and I must say: Well Done! It actually fits for Junsu himself. For a price of ₩17,000 (USD$14.60) (T/N: Based on C-JeS Store), I think it’s worth to purchase and fans can really enjoy the photos from the photo book. What are your thoughts about this album? I would be glad to hear from you. I like the whole concept from the cover, the photos taken and the songs themselves. I must say that Junsu really stepped away from his image as part of JYJ and transform himself to Xia Junsu the solo artist with this album.